Loop around the lazy river with the kids. Little ones can play in the water fountains in front of the ocean. Your rental is next door to all the rides and fun of Family Kingdom Amusement Park. The oceanfront lap pool is a great place for the grownups to relax. Spacious, newly remodeled vacation rentals give your family room to spread out. You're right on the beach in the heart of the action. Overlooking the ocean, it's a great place for kids to play, while grownups lounge by the adult pool. You can walk to the boardwalk, Skywheel, and tons of shopping and dining. Grab a drink at Coconut Willy's pool bar. 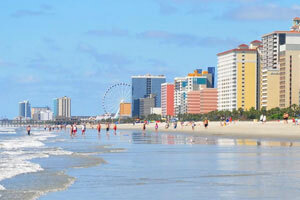 Westgate Myrtle Beach Oceanfront Resort is located in the heart of the Grand Strand. Once you get settled in your condo, get everyone changed into swimsuits and slathered in sunscreen. Grab goggles and water wings and get ready to party. Go for a relaxing swim in the outdoor pool or float along the lazy river. Order a drink from the poolside bar and work on your sun-kissed look while the little ones go wild at the children’s water play area. Hungry? Have the kids carry hot dogs, burgers and paper plates to the bbq grills for a family cookout. Don’t forget the ketchup! Don’t feel like cooking? No problem. The resort has an on-site bar & grill, pizza restaurant, and a bistro. One-bedroom condos sleep four guests and have Oceanfront or Ocean Views. Kitchenettes allow you to prepare the basics (or heat up leftover pizza). One-bedroom deluxe and two-bedroom condos sleep four to nine guests and have jetted tubs and in-suite washer/dryers. A family field trip to the Food Lion Grocery Store is definitely in order; your full kitchen won’t stock itself. Get your Betty Crocker on and bake your famous chocolate chip cookies. Let the kids do the mixing (and be in charge of the chocolate chips). Catch a sitcom rerun on the Flatscreen TV; it has Cable. DVD players are perfect for a low-key night in for family movie night. Bring favorite movies from home, pop some popcorn and call everyone into the living room. First kid on the couch picks the movie. Good news! Westgate Myrtle Beach Oceanfront Resort is a pet-friendly resort, so your four-legged family member doesn’t have to miss out on all the fun. The Family Kingdom amusement park features over thirty-five thrill, family and kid rides and is just across the street from the resort. Rides include roller coasters, bumper cars, bumper boats, a Ferris wheel, train, and go-karts. Check out Family Kingdom’s water park, Splashes. It features children’s areas, intermediate speed slides, water flumes and a lazy river. Ready to shop ’til you drop? Visit Broadway at the Beach. Little ones will love creating their own stuffed animal at Build-a-Bear. Head to The Mole Hole for collectibles and gifts. Reigning Cats & Dogs is the place to go for gifts for your four-legged family member. When it’s time for lunch, check out Hard Rock Cafe, Señor Frogs or Joe’s Crab Shack. Go for a ride on the Myrtle Beach SkyWheel. It’s almost two-hundred feet tall, features climate controlled gondolas so everyone can ride in comfort and provides the best views in Myrtle Beach. Any golfers in your party? Whispering Pines Golf Course is only ten minutes from the resort. It was designed by Finger, Dye and Spahn and has its own Pro Shop. Only dogs and cats are allowed, maximum number of pets per room is 1, pet maximum weight in kg is 27, pet maximum weight in lb is 60.